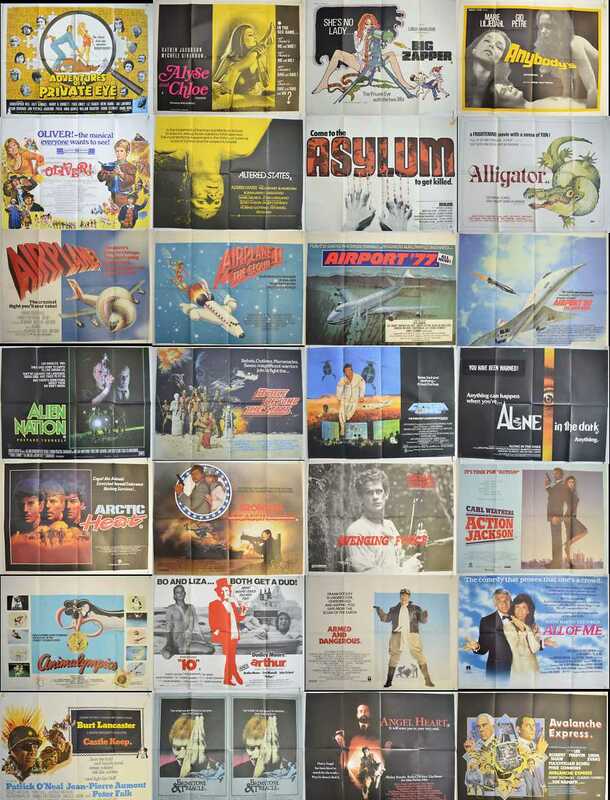 This week’s auction comprises of over 50 Original British Quad Posters from the 1970’s and 80’s. Starting with an Airplane theme, including comedies “Airplane” and “Airplane II – The Sequel”, plus disaster movies “Airport ‘77” and “Airport ’80..The Concorde”. Under the Action genre I have “Big Zapper” starring Linda Marlowe, “Action Jackson”, “Avalanche Express”, “Avenging Force” starring Michael Dudikoff who also takes the lead in “American Ninja 2” (what ever happened to him? ), of course the genre would not be complete without an offering from Charles Bronson and he takes the lead in the 1987 movie “Assassination”. Horror fans might enjoy “Altered States” by renowned director Ken Russell, “Asylum” (a.k.a. House Of Crazies) featuring Peter Cushing and Britt Ekland, or perhaps the 1982 “Alligator”. I also have a couple of offerings from the Exploitation genre such as “Alyse and Chloe”, “Anybody’s” and “Adventures Of A Private Eye”.